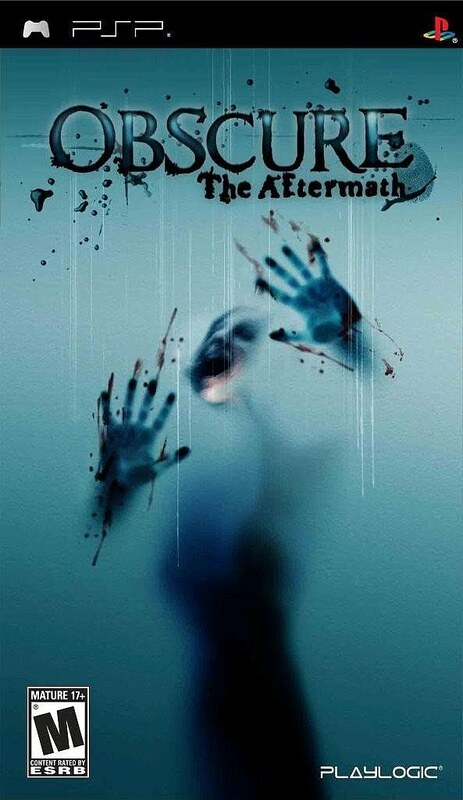 Obscure: The Aftermath Hands-On | "DESTROY ALL FANBOYS!" 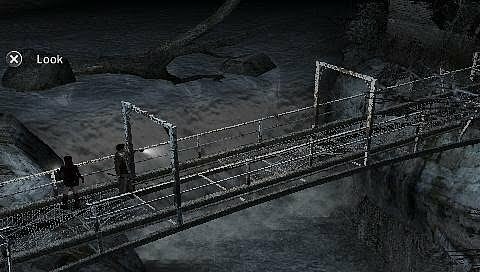 Way back in 2004, a scary little survival horror/adventure game called Obscure crept onto the PlayStation 2, Xbox and PC, receiving mixed reviews before disappearing from the scene and becoming something of an eBay collectible. 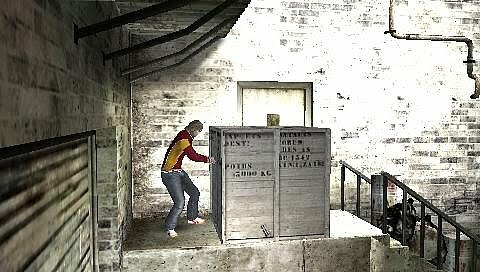 The game still sold in well enough numbers that a sequel, Obscure: The Aftermath (or Obscure II, depending on where you’re reading this) was released in 2007 for the PS2 and Wii. 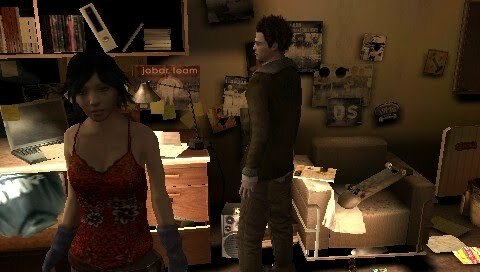 Thanks to Playlogic and developer Hydrovision, that sequel is headed for the PSP on September 29 and thanks to their PR department, I’m writing up this hands-on of a preview build. Featuring disturbingly detailed visuals, plenty of “teen slasher flick” ambiance and wireless drop-in/drop out co-op play, this is one game horror fans looking for a wild ride won’t want to miss. No previous experience with the first game is needed to understand the plot, as the game takes place two years after the events in the original and things get rolling pretty quickly. There’s a college campus overrun by those deadly black flowers from the first game, a bunch of really dopey students that decide to use said flowers as a party drug (always a smart thing, no?) and a handful of playable characters that set out to put an end to the menace once and for all. Granted, they don’t intend to at first; the game actually starts out with a pair actually ingesting some of the black flower “tea” and going into a brief, trippy playable tutorial sequence that packs in a bunch of different scare tactics while it lasts. 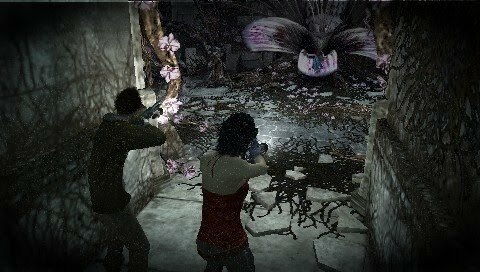 Both the original Obscure and the sequel use fully 3D environments rather than pre-rendered backdrops, so expect certain objects in each area to be either destructible or otherwise interactive. Some bigger monsters can actually smash through walls to get at you, which makes for a few “jump out” scares when you least expect it. Creatures come in a few different varieties, from mutated humans to annoying ankle-biters that will have you swinging like mad at the ground whenever they show up. There are a few other nasties to deal with, but these come later in the game along with a few plot twists that are sure to keep you on your toes. 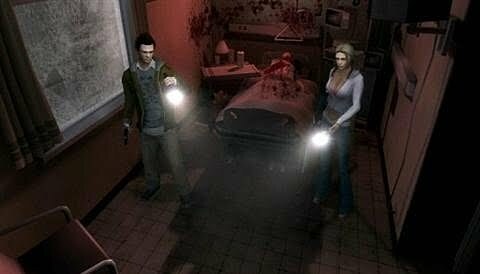 If you’ve previously played the game on the PS2 or Wii, you’ll appreciate the exploration and adventure game elements mixed in with the survival horror action sequences. 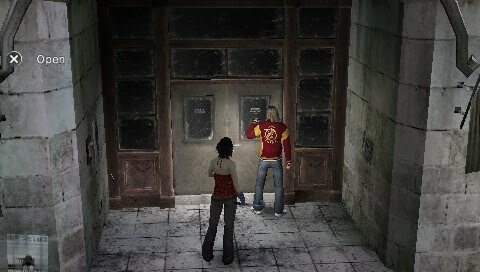 You’ll also appreciate the game not being as dark as the console versions, thanks to the PSP’s brightness settings. 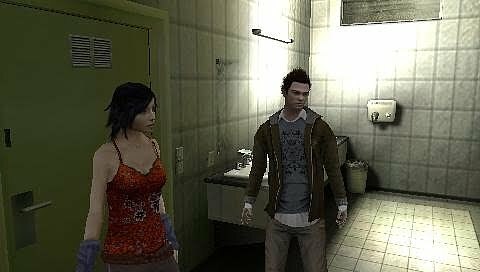 The game starts you out controlling a pair of teens with a second pair popping up a short time thereafter and third pair not too long after that. Controls are fluid with switching to your partner a tap of the Triangle button away. You’ll need to swap out characters and mix up pairs of traveling partners as each of the teens has a special skill required to solve particular puzzles, reach new areas and the like. The biggest (and most welcome) change here is the save system. in the PS2 and Wii versions, save points vanished when used, forcing you to go long stretches through dangerous territory before you found a new save point. Now, save points can be reused as many times as you like. In terms of combat, there are a wide range of melee weapons here as well as a smaller variety of firearms. 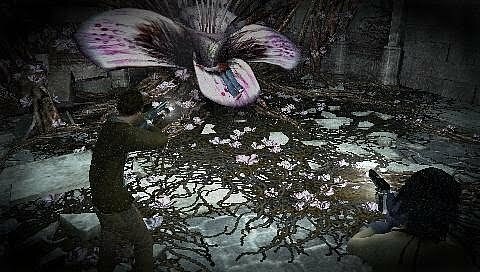 As the AI tends to blast away at monsters when armed with a gun, equipping your partner with a bat or other melee weapon makes sense until you get to a boss battle or stock up enough ammo for them to use on other creatures. One thing that’s really cool is the gun aiming system that uses the D-Pad in conjunction with the Right trigger for precision aiming. It’s slightly tricky at first, but once you get used to it, ceiling, wall or floor critters become less of a pain to deal with. As in the first game, however, you can shoot or beat your AI or real-life buddy to death if you’re careless and nope, friendly fire can’t be turned off. This lends encounters a bit more realism and forces you to not spaz out on the action button when there are monsters to kill. 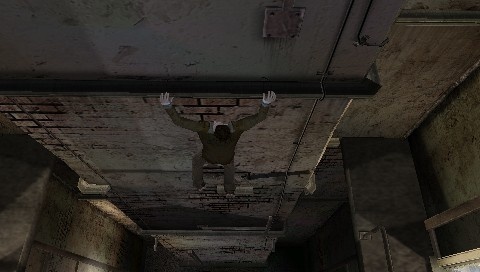 Graphically, the game impresses immediately with detailed character models, cluttered background with readable signs and other elements that add a solid sense of realism to things. 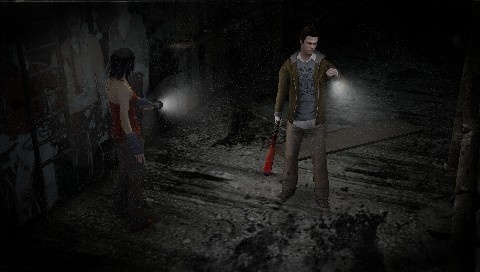 Lighting effects are also well implemented, particularly where flashlight use is concerned. 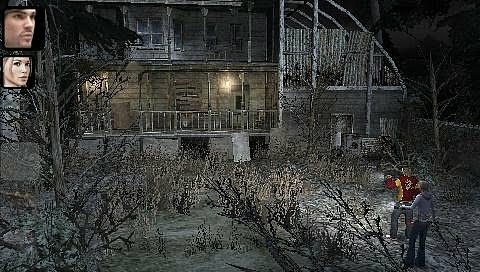 In the creepier locations where monster encounters are high, you’ll find yourself going from walking slowly to running like hell when things get too tense. That Mature rating isn’t for show, as the game isn’t shy about showing plenty of gore. 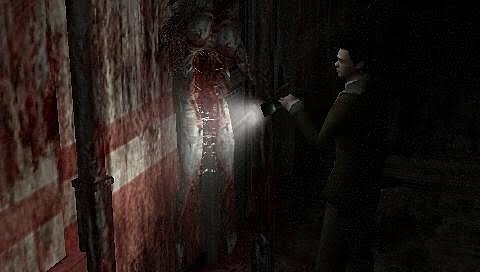 Half-chewed headless bodies or corpses in various states of damage are par for the course and some areas where bloodstains lead to closed doors or other areas will make you think twice about venturing forward… until you realize it’s your only movement option. Just make sure you’re healed up and ammo is locked and loaded is all I’ll say. Sound effects are quite well done, and an excellent score performed mostly by the Boston String Quartet and Paris Opera’s Children’s Choir mixes in unsettling tunes with driving action pieces. 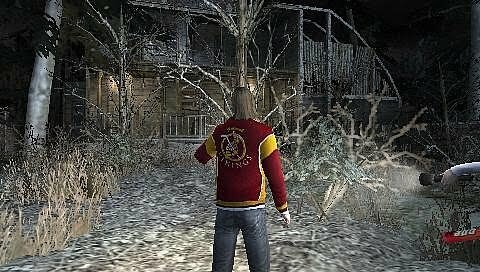 The voice acting mixes in serious and campy elements and like any teen slasher flick, it’s hit or miss, but it all fits the game’s tone perfectly. You might not like all the characters you get to play as, but keeping them alive is of prime importance if you want to make it to the ending. Co-op wasn’t test-able in this build (you’ll need two copies of the game and two PSP’s for this), but if the original is any indication, it should work very smoothly. Hell, I had more fun with the AI and co-op in both Obscure games that I did with the co-op in Resident Evil 5 and that’s saying a lot. 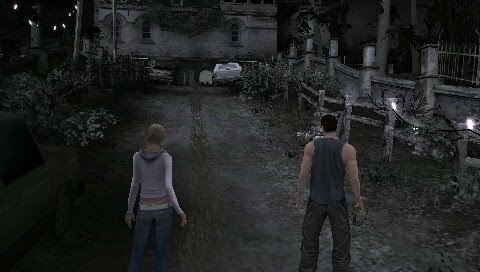 Anyway, September 29, 2009 is the release date and if you’re a horror loving PSP owner, this one has your name written all over it. As a big genre fan, I can safely say this one looks like a hit on the PSP when it ships. All Playlogic needs to do is get the rights to publish the first game and perhaps get those mega-talented folks at Hydrovision to cook up a third game in the franchise and I’ll be an even happier guy. 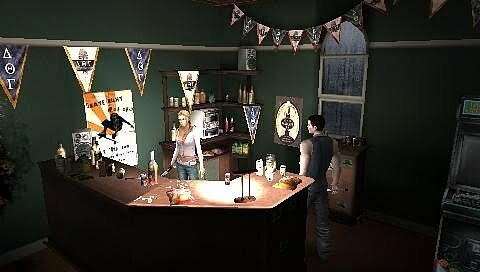 This entry was posted in Updates and tagged Coming Soon, Cover Art, Gallery, Hands-On, Hydrovision, M-Rated Games, Mature, Obscure: The Aftermath, Playlogic, PSP, Screenshots, Updates, Video Game Previews by geelw. Bookmark the permalink.